True Love Means Cleaning Up the Messes! We can thank Jesse’s upbringing on a small hobby farm for her incredible work ethic and her mad cleaning skills that keep the clinic at its sterile best. Even when doing the ‘dirty work,’ her infectious smile fills the souls of clinic staff and clients alike. At home, Jessie enjoys long walks on the farm with Millie and Daisy, her two badly-behaved pigmy goats, and time spent with her horse, Molly, Milo the Maltese, and Hank, the three-legged wonder cat. Most of all, Jessie is known for her soft and caring heart. Tears come easily to her; the happy tears brought on by a new puppy or kitten, or the sad and consoling tears at the loss of a loved one. And our favourite tears yet – the joyful tears brought on by the recovery of a co-worker’s dog induced to bring up chicken bones, avoiding surgery. That’s Jesse. She joined us as as assistant, just after graduation from Academy Canada, and is currently embarking on an exciting journey to become a Registered Veterinary Technician. 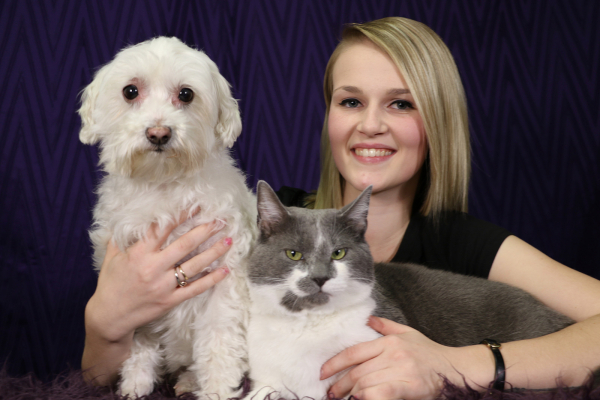 Thank goodness Jesse fell in love with the veterinary industry because her team certainly could not live without her!